February 14th; you either love it or you hate it. Like most things, when it comes to a female perspective, a girls view on Valentines Day is one that can change almost as often as her shoes. Personally, I have been on both sides of the fence. I’ve been the girl who sits and stares at the happy couple holding hands, wishing more than anything that I could be like her. Wishing that I could find a boy who smiles the way that he smiles at her and whose hand fits perfectly in mine. I’ve been the girl who dreams of being someones princess; the girl who would give anything to be spoilt, even just a little. I’ve been the girl who prays that maybe today he’ll notice, maybe today things will be different. I’ve been the girl who stood in a room full of people, smiling, but who still felt completely alone. I’ve been the girl who has felt like she is the only girl in the world without a boy to love her, for exactly who she is. Deep down though, as cliche as it sounds, all any girl really wants is to find love. Real love, not the fairytale kind. The kind of Prince Charming who was made just for her. All any girl really wants is for a boy to come along and sweep her off her feet. For him to treat her like a princess. For him to come along, completely out of the blue and show her why it never worked with anyone else. All any girl really wants is to be just like the rest of the world; at least for one day. She wants to have flowers sent to her door and a giant teddy to cuddle. She wants to feel like she is the luckiest girl in the world and that just in that one moment, she was the most important thing in his life. All any girl really wants is just to feel loved, even if it is just on February 14th. As hard as it is though to constantly be hoping, wishing, praying that you’ll find him, don’t let that discourage you. Don’t ever lose hope, because eventually, after all of that pain and all of that heartache, just when you think you couldn’t possibly cry anymore tears, you will find him andwhen you do, I can promise you that what they say really is true. I promise you that it truly will be worth the wait. Everything happens for a reason and I believe that completely. So next time you find yourself sitting there, heartbroken, that on one specific day he didn’t send you a bunch of flowers. Instead of overthinking every little detail and crying to yourself over something that is out of your hands, stop doubting your worth and chuckle a little, because the truth is, when you find him he won’t need just one day to spoil you. He’ll have 365 days and every single one of them will be magical. Who knows, maybe he won’t get you red roses, maybe he knows that peach is your favourite and maybe you won’t get a teddy bear, because he knows that really you’d much prefer a singing and dancing penguin. Maybe this time you won’t just get one single flower, maybe he’ll be the first boy to give you a whole dozen and maybe you won’t get a card saying ‘I love you’, but instead he’ll go out and buy you the entire series of your favourite Television show instead. So don’t fall like the rest of the crowd, stand tall. Don’t settle for someone who will just smile and give you chocolates, just because he feels that it’s what he is meant to do. Wait for that boy who smiles with his eyes, not just his mouth. Wait for the boy whose whole face lights up when he looks at you and who spoils you in a way that you never could have imagined. Wait for the boy who knows you better than you know yourself; because he’s the one that will make it all worthwhile. 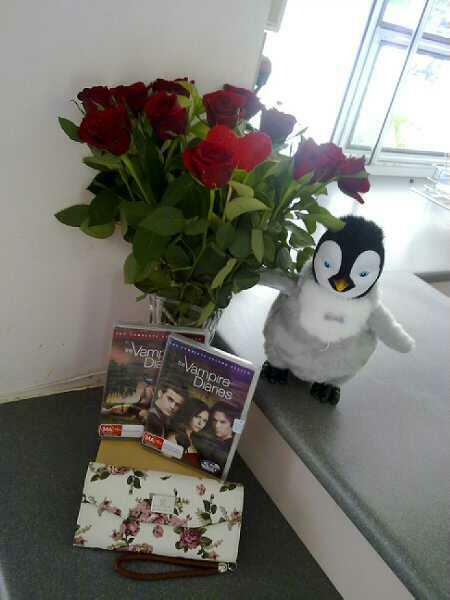 Wait for the boy who makes your whole life ‘Valentines Day’, just because he can.